I have returned to my location in the woods for the last time this year, as I won’t be returning until mid January. The woods felt very different even just from my last visit. While going into the entrance to centennial woods, I was met by a much browner landscape than before, a sure sign that the transition from fall to winter is almost complete; all that’s lacking now seems to be snow. What really captured my attention was just how quiet it was. 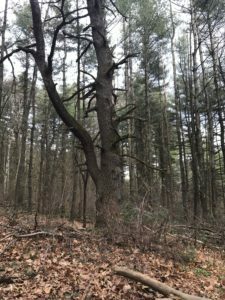 The breeze wasn’t strong enough to sway the trees or low lying plants, and not an animal could be seen or heard, so I was the only thing making noise, as I crunched through the leaves and pine cones scattered along the trail. When I reached my spot, I was quite startled, as there were two small children running around the open space, laughing and playing, accompanied by their mom. 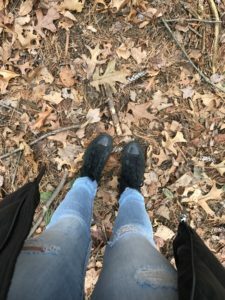 While almost initially annoyed that I couldn’t come and do what I wanted to for this blog right away, I realized how great this actually is; that they’re getting to experience nature in it’s true form, and that they have access to it, so I decided to walk the trails and wait until they finished exploring before going back. When I returned to my spot, it looked far more bare than last time. It looked as though all of the fallen branches from the wind storm had been moved or collected, most likely by humans, and many of the smaller vegetation plants have lost their leaves and turned brown. 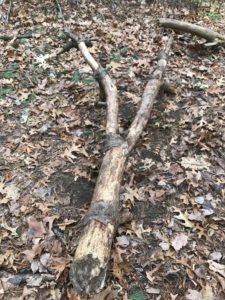 Furthermore, the log I oftentimes sit on has been moved across the open area, and now sits by the large eastern white pine, and a new branch lies here as well. Other than these slight changes, the flora of my location appears to be roughly the same as last time. As I stood up against an oak tree,I heard some small chirps, then saw a black capped chickadee fly over my head and onto a pine branch. Then I heard a rustling in the leaves, and saw a squirrel digging through them. It saw me, and we both stopped moving and stared at each other for a while, it getting up on its hind legs, before it ran up a tree, and jumped branch to branch, tree to tree. I found myself leaving my place far more relaxed and peaceful than I was when I arrived, as the woods took away all the stress I was/am feeling due to finals coming up.